Some of the Junior Sky Blues at their first meeting of the season with special guest Stephen McBride. 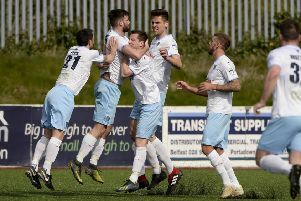 Ballymena United’s very own junior supporters club ‘Junior Sky Blues’ kicked off in style for their first meeting of the season last week. Special guest was United left-back Stephen McBride and as well as joining in with the games, Stephen got ‘stuck in’ helping the children with their glossy new club scrapbooks, proudly sponsored by Moy Park. This specially designed scrapbook will be completed throughout the season, bringing together information on the club and players, press cuttings which the children will be encouraged to collect during the year and of course player autographs! Lucky winner of the September prize draw was Katie Shaw who won a signed football. If you have a child or grandchild under the age of 12, Junior Sky Blues is a great way to make them feel part of the Football Club. There is still time to register before the next meeting which will take place on November 7 at 2pm before United’s home match against Glentoran. Membership costs £25 per child or £40 for two children from the same family. The club also give a free season ticket to each member. Everything is included in the price of the membership fee, 100% of which goes to cover the cost of prizes, refreshments and activities throughout the season. Memberships can be purchased from the website www.ballymenaunitedfc.com or from Stirling Trophies, Queen Street.